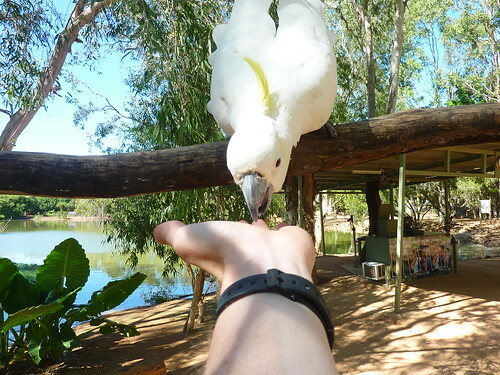 Whilst we were in Perth, Rob had recommended we visit the Billabong Santuary. Since it was only 30 minutes down the road from Townsville, we were perfectly placed to pop in. The park itself is pretty small. This in no way detracts from the experience; in fact, the staff cram more hands-on experiences and information into a day than zoos ten times bigger can manage. 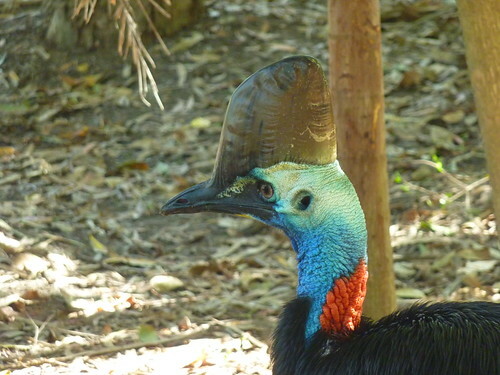 After missing seeing a cassowary in Cape Tribulation, it was great to be able to get up close with them here. They have quite remarkable colouring and an amazing ability to swallow large pieces of fruit whole which I'm pretty envious of. 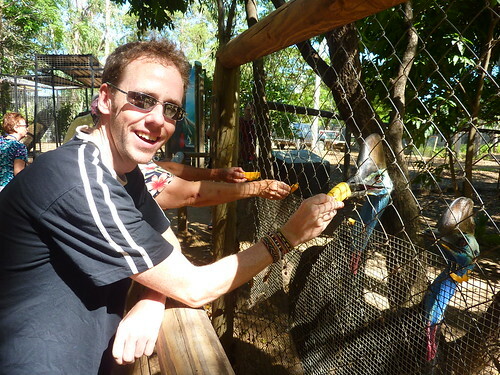 All of the visitors (totalling about 10 - it gets pretty quiet as it approaches "winter", another reason the park was so enjoyable) got to feed the cassowaries, who ate the best part of half a bucket of fruit each. 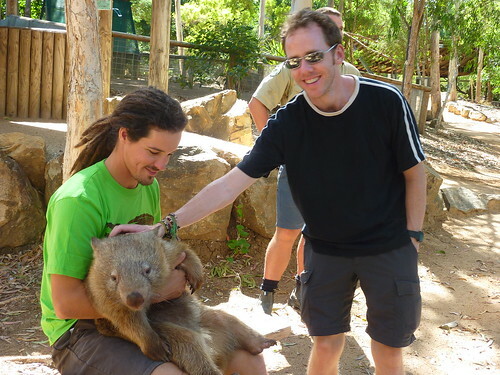 The next show was a wombat talk, where we came face-to-face with a 3.5 year old called Tonka who was an extremely tame wombat and loved being handled. 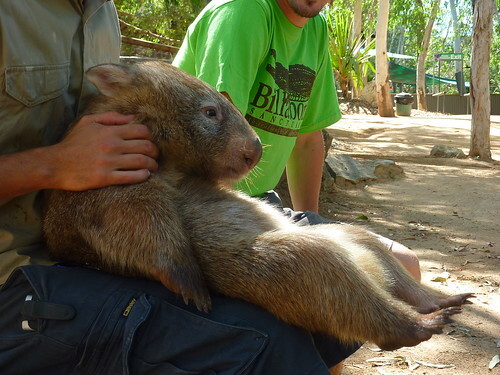 So much so, that when there was a renovation of the park after the cyclone which meant that he didn't get cuddled each day, he went into a kind of "wombat depression" and lost a shedload of weight. As soon as normal handling duties resumed and he was getting a decent amount of lap time, his weight went back to normal. Amazing. 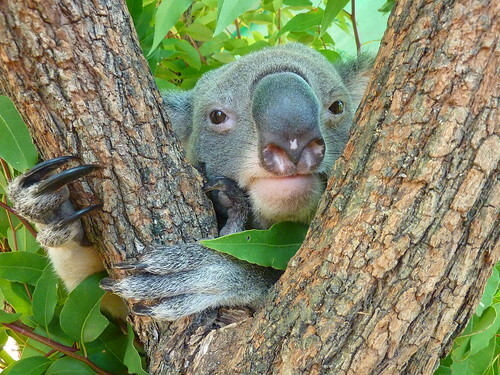 Wombats are surprisingly agile creatures who can run at up to 40km/hour and dig 2m/hour. After the talk, we got to stroke Tonka. His back was incredibly tough; tapping it was like knocking on wood. There's a reason for this hard bone: when predators try to chase wombats down their burrows, the wombat simply crawls as far as it can and then sits with its back to the pursuer, be it dingo, wolf, or whatever. 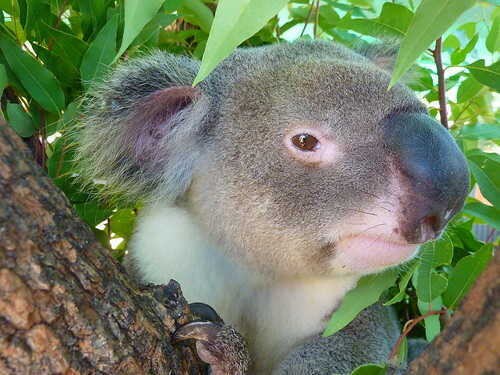 The attacker can hammer and bite all it likes against the wombat's back but all it will do is damage its own teeth. There are reputedly stories of wombat holes which have been found with crushed skulls inside, from where wombats have waited until the animal biting it has got into just the right position, and then lifted its back up to smash the offending creatures head into the tunnel wall. How true this is I'm unsure of, but it sounds brilliant. 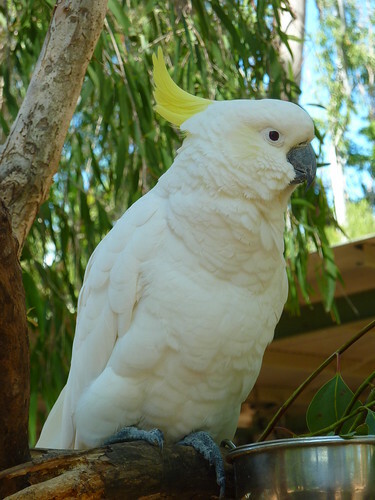 Jacko, a sulphur-crested cockatoo was next. She loved eating sunflower seeds from the kangaroo food we'd bought (she wasn't keen on the rest), and was happy to screech "Hello!" at us every few minutes if she thought she'd get some food. 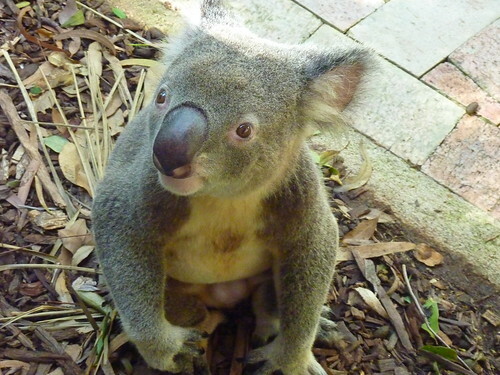 We moved on to the Koala pens where we met a number of cute bears including Ray Charles, a blind koala. Even so, he had a knack of knowing where the camera was, and was more than happy to pose for us. 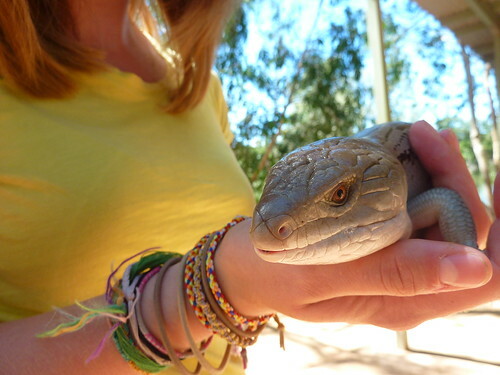 We were taken to the reptile hands-on next, where we got to hold a boa constrictor, blue-tongued lizard, and a baby croc. As well as this, kangaroos are prevalent throughout the park and we were able to feed them whenever we liked. They were happy to hop over and nuzzle into our hands looking for food. 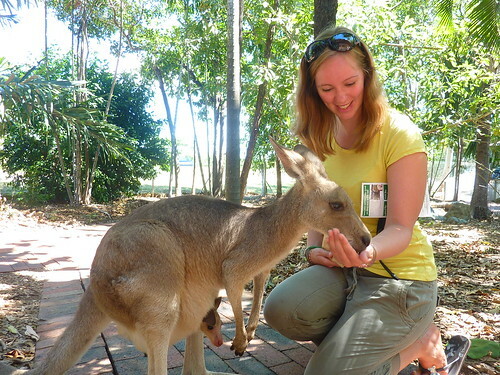 Here, Gilly proved very popular with a kangaroo and its joey. We also got to feed fish to some turtles. 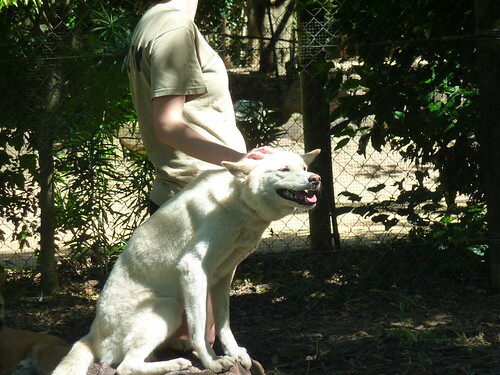 The dingoes were gorgeous, and had obviously been looked after well given the shininess of their coats and their happy, lolling tongues. We were introduced to Allira who I could quite happily have taken home. 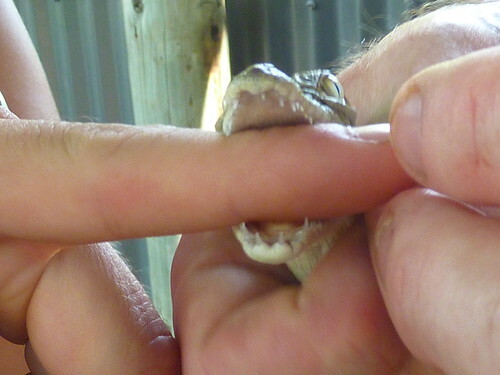 Saltwater crocs were good fun, with one called "Psycho" living up to his name as one of the handlers fed him up close. 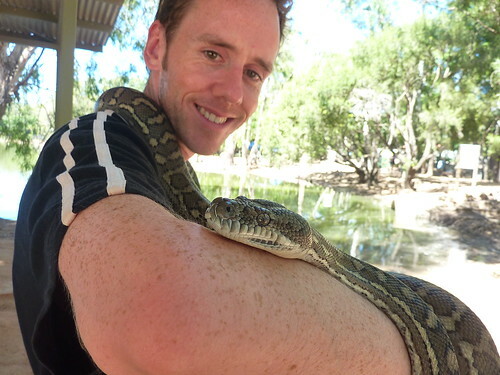 I can also proudly say that I've been bitten by a crocodile and survived the traumatic event. 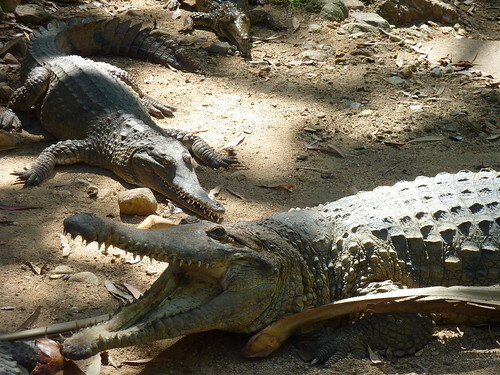 OK, it wasn't perhaps the largest specimen, but a croc's a croc...right? His teeth were like needles and actually drew blood. 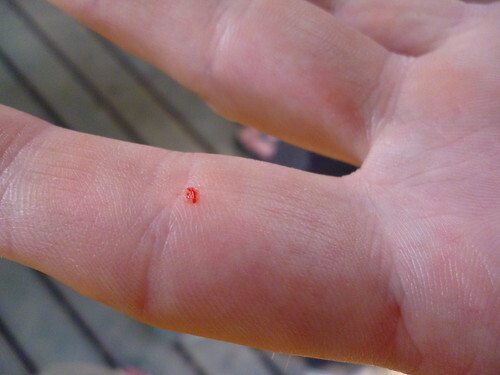 My wound lasted for at least two days after this horrific attack. Alligators were on the agenda and we got to see a great example of their rolling attack, which they use to drag their prey underwater and drown it. We were also treated to a bird show and a snake show. 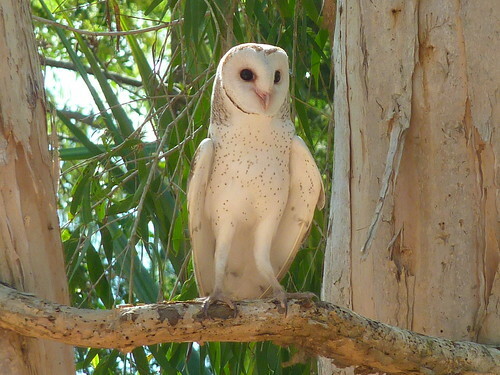 The former included favourites such as the world's most widespread and common bird (the barn owl), a black kite, and a barking owl. The latter had the handler getting to grips with the planet's three deadliest snakes: the king brown snake, the eastern brown snake (which accounts for half of all snake-bite fatalities) and the coastal taipan (which has venom 50 times more powerful than the indian cobra). We were also shown how to treat a snakebite through the use of compression bandages, and assured that snakebites are more often than not non-fatal because it takes a while for the venom to get around your body. The handler told the tale of someone who got bitten, wrapped a bandage around the bite, then went and watched TV. He somehow forgot about it until a couple of days later when he removed the bandage - at that point, the venom started circulating and only then did he start feeling dizzy and decided to go to hospital. Just goes to show how effective bandages can be. Personally though, I'd probably have sought medical advice straight away. Maybe that's just me and my crazy common sense. 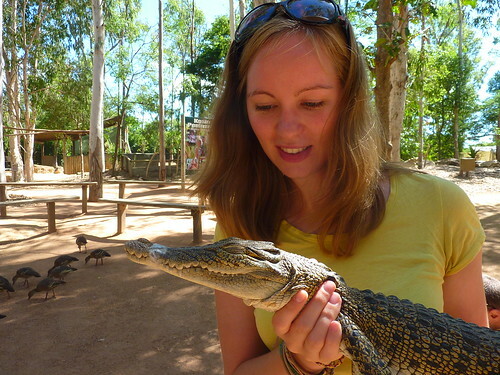 The Billabong Sanctuary was a fantastic day out. 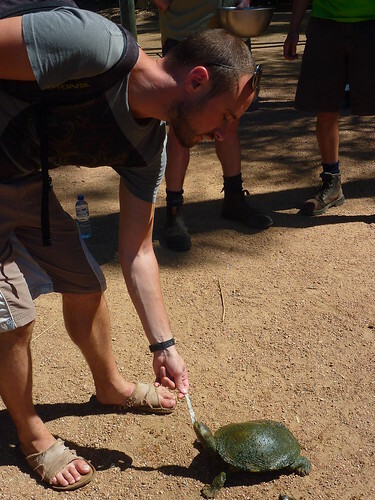 You can get a whole heap of information and enjoy up-close encounters with many native species. 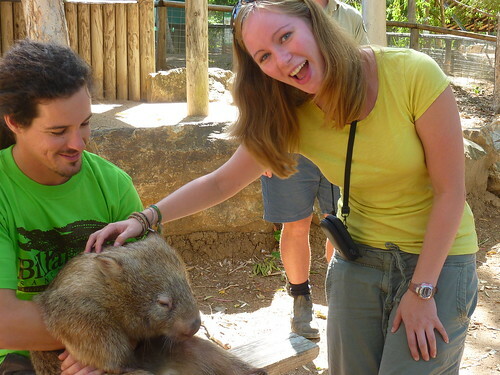 I think wombats, kangaroos and dingoes are my favourite of the native animals here. 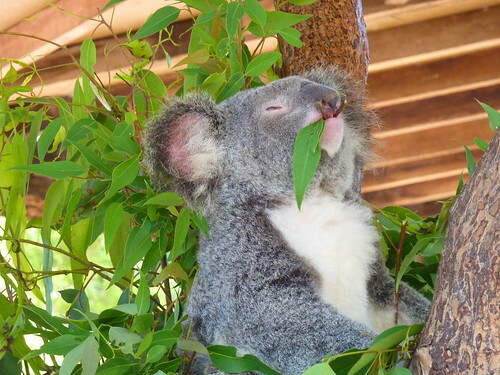 Wombats are fat and lazy and a lot cuter than koalas. Kangaroos are pretty cute (even when they've got a pink foot sticking out of their torso) and dingoes...well, they're just big fluffy dogs. And I love dogs. On a side note, they also sell what is possibly my favourite ice cream discovered so far on our trip: Heaven Chunky Cookie. I've not yet found anything that can beat it. That evening we drove to a free campsite in Home Hill, a wonderful place next to a train station which had a large kitchen, fully equipped with BBQs, sinks, power and water - all for public use. Basically, the kind of place that would get trashed if it was in the UK. Australians certainly know how to look after their amenities. We rustled up some grub and had a good evening; the trains didn't wake us up too much at night (there's always a catch! ), which was good as we needed to be up early the next morning to go scuba diving around the wreck of the SS Yongala.